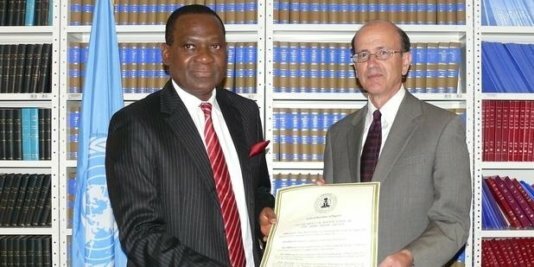 Nigeria’s ratification of the landmark global Arms Trade Treaty (ATT) on Tuesday is a welcome move that should pave the way for more African nations to get behind the treaty, Amnesty International said. “By signing and ratifying the lifesaving Arms Trade Treaty, Nigeria has indicated its willingness to join the global society in ensuring strict control of the international trade in conventional arms,” said Lucy Freeman, Deputy Africa Programme Director at Amnesty International. The ATT would prohibit states from transferring conventional weapons to countries when they know those weapons would be used to commit or facilitate genocide, crimes against humanity or war crimes. At least 500,000 people die every year on average and millions more are displaced and abused as result of armed violence and conflict. Since it opened for signature on 3 June this year at the United Nations in New York, 83 countries from every region of the world have signed. Besides Nigeria, Iceland, Guyana and Antigua & Barbuda have already ratified the treaty. Many more countries – including key arms-producing countries in the European Union – are currently in the process of ratifying the ATT, which will enter into force shortly after 50 countries have ratified.